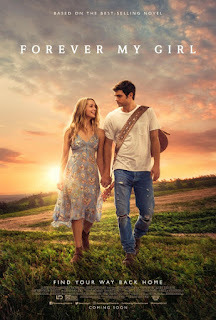 This story is rather like a fairy tale that resembles an adolescent girl’s fantasy, starting out with a tragic jilting at the altar, then moving to the would-be groom’s country music career and fame on the road, and on to regrets and efforts to atone. The film is written and directed by Bethany Ashton Wolf, based on a novel by Heidi McLaughlin, an author who writes about how people can “find their relationship with God and each other…[her] passion emerged through her personal discovery of how God’s love heals and restores all our brokenness” (information from a search of “Heidi McLaughlin”). The film opens with the bride Josie (Rothe) at the church waiting to go down the aisle when she receives word that Liam (Roe) is not going to appear. No explanation is given, but he is shown performing country music at concerts, followed by hordes of young people, so we assume that he has chosen that lifestyle over being tied down in St. Augustine, Louisiana, with his high school girlfriend. Eight years transpire, and it is clear that Liam has become an over-indulged star whose every whim is catered to and every need taken care of by his staff, largely his agent Sam (Cambor). Two incidents draw him back home: Damage to his precious cell phone that he has kept for years and news that his best friend from school was killed. We find out later why that phone is so important. At any rate, he impulsively runs to the funeral, abandoning his music tour, and of course crosses paths with his jilted sweetheart Josie. There, he learns of some shocking news that could potentially change his life forever. It prompts him to remain in his hometown for a while, staying with his widowed father, who is Pastor Brian (Hickey) at the community church. Never underestimate the ire of a small town when someone has transgressed, and that ire is what Liam faces when he returns home. He gets it from Josie (whom he clearly still holds a torch for), his father, Josie’s brother, and all the townspeople he meets. But his father is a good Christian pastor, and soon preaches (apparently after wrestling with his own demons) about mercy and forgiveness. Liam will not have an easy time of it, proving how hard it is to overcome a bad reputation, but he handles it with humility and grace—making a few mistakes here and there—and learning that money is not necessarily a motivator for everyone. The rest of the fairy tale spins out largely as expected, particularly in consideration of the principles of the novel’s author. The film is well directed and the actors are skilled, particularly Hickey, who has to portray someone with a son he loves but gives him grief, a pastor who must comfort others, and ultimately, show that he can see his son in a different light. Alex Roe and Jessica Rothe as the leads do well individually, but the chemistry between them is less convincing. Along with the day-dream-like script, I had a big problem with the lines written for Josie’s daughter Billy (Fortson). The actress was great, but there is no way a seven-year-old would say things like, “You two weren’t exactly subtle, if you know what I mean” and we should “help him process the news.” Nor would she be likely to reproduce some guitar riffs after seeing them for the first time, without any previous training on the guitar. This is a film for fairy tale lovers. This film had potential, but the filmmakers chose instead to make it one long, two-hour gun battle nonstop. We hear a bit about the characters in the beginning, but not really enough to feel invested in them. We are given a bit of war planning and arguing, then the 12 committed men are sent to Afghanistan as elite special forces with the primary purpose of disempowering Al Qaeda. They will secure the alliance of a Taliban warlord with grudges against his rivals and a mutual hatred of Al Qaeda, which has just attacked the U.S. on 9/1/1. If we could have been given more back story about Captain Mitch Nelson (Hemsworth) who secured undying loyalty from his team including Hal Spencer (Shannon), Sam Diller (Pena), and others, their confidence in him and his leadership would have been more gratifying. This is even more salient for the character General Dostum (Negahban), the Taliban leader with whom Captain Nelson has an ambivalent relationship. What a rich and illuminating history he must have. Having some light shed on the political and historical background of these relationships would elevate the story beyond constant war skirmishes. I’m reminded of the jokes about American westerns’ “white” hats and “black” hats that helped us identify the warring parties. 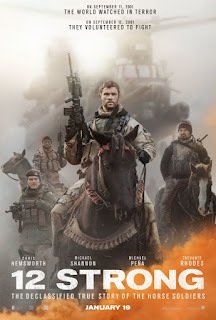 We have no such clues in 12 Strong, where it’s often difficult to tell which fighters are American and which are which Taliban. Some of them are robed, and we know they are Afghans, but which are General Dostum’s and which are enemies is difficult to see. My hunch is that those who are familiar with videogames—which are fast-moving—will have an easier time than I had. Production designer Christopher Glass and the visual effects artists have created impressive sets and special effects. It is thrilling to see the American bombs hitting their targets and rockets flying through the air. These filmmakers did their jobs well; I put most of the responsibility for neglecting character development in favor of never-ending battle scenes at the feet of the director, Nicolai Fuglsig. I believe this is his first foray into directing a feature film, and hopefully, next time he will attend more to emotional and character development to give depth to his films. Chris Hemsworth is effective in depicting a dedicated American war hero who is sharp and cagy in his analyses and attuned to nuances and competing agendas in his dealings with others, whether friend or foe. We do get a better idea of what kind of person he is. That is not the case with the characters of fine actors like Michael Shannon, Michael Pena, Taylor Sheridan, and Navid Negahban. They were wasted in this movie, considering their intrinsic worth. This is a story that needs to be told, but with many more details about the circumstances and the people involved. Knights on (not white) horses win the day (not the war) in Afghanistan post 9/11. This adventure centers around an antique book about London which Paddington (Wishaw) discovers in Mr. Gruber’s (Broadbent) shop, and wants to send to his Aunt Lucy, who has always longed to see London. When Paddington learns that it is valuable, and he’s going to need lots of money to buy it, he immediately looks for work. The barbershop doesn’t work out so well after the electric shears get the best of him, but he discovers he is an excellent window cleaner and works diligently with amazing acumen cleaning the windows of multi-story buildings. And he gets close to being able to buy the book for his aunt. Wherever Paddington goes, as we know from the earlier book and film, he charms everyone with his Aunt Lucy-isms (e.g., “If you look for the good in people, you’ll find it”) and helpfulness. But this is a substantive kind of charm, illustrating so well how politeness, diligence, and seeing the good in others changes them. The story is not just about “nice” things, however; there is a villain named Phoenix Buchanan (knavishly played by Grant) who exploits what he hears from the innocent Paddington. Putting that information together with what he already knows (that there is a valuable pop-up book that has been missing for years), he concludes that it could solve all his financial and professional problems. (His magic acts have been failing and he is drowning in debts). We get to hear about the history of the book and how it came to be, which is an interest heightening segue). From here, the story transforms into more of a thriller, with Paddington being accused of a crime, tried, and put in prison. This takes all the resources of his beloved Brown family (Sally Hawkins, Hugh Bonneville as parents), as well as friends he has made in prison, such as the grumpy cook Knuckles (Gleeson). 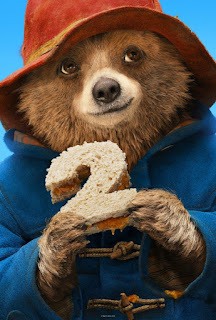 (Paddington won him—and the other prisoners—over with his marmalade sandwiches.) Along with his family, these newly made friends promise to exonerate him. After seeing how well Paddington navigates the prison system, things take a turn, after which, we have some nail-biting scenes involving a prison break-out, trains, and near-drowning that make the film into a thriller. Paul King, director, and writer with Simon Faraday, based on Michael Bond’s story, has scored again with a Paddington story that interests and thrills viewers, along with providing thoughtful observations about humans and how we function. They are optimally aided by musician Dario Marianelli and cinematographer Erik Wilson, along with a plethora of artists in production design, sets, costumes, and special effects. The actors (Sally Hawkins, Hugh Bonneville, Hugh Grant, Julie Walters, Jim Broadbent, Brendan Gleeson, et al) bring it all to life in a way that is entertaining and thought-provoking for children and adults. It’s so rewarding to see a film with so much humane, visual, aural, and technological artistry. Would that all so-called “children’s” films were of such high quality. Before the intense adventure, there is warmth and loving connections. What could go wrong? We meet the Ranier family living in Five Keys, New Mexico, in the ‘50s, and find that things are not well, especially with young Elise (Ava Kolker and Lin Shaye), whose father becomes brutal when her special powers are in evidence. She refuses to lie by saying she doesn’t see ghosts, so he beats her and locks her in the cellar. (There are a number of weaknesses in the film, one being very bad parenting.) As time goes on and the situation worsens, Elise does what any sensible young woman would do, she leaves home. Elise is guilt-ridden for leaving behind her younger brother Christian, ignoring the fact that she was only 16. There will be lots of blood, gore, and murder to satisfy the horror genre fan, but the film will be tedious for those who have questions that pop up, like, “Why doesn’t Specs call the police when there is a man with a gun in the house?” And when one suitcase after another is opened with little scares, you know that soon there will be one that will draw gasps from the audience. Lin Shaye is a talented actress who has starred in all the Insidious films, and she is expert in mixing the wonder, wisdom, care, and concern that her character needs to show. If this film has any redeeming value, she is it. Alas, the filmmakers’ efforts to imbue the Tucker and Specs duo with levity simply comes across as corny and even lecherous when they noodle up to Christian’s two young attractive daughters, whom we know in real life wouldn’t give them a second look. 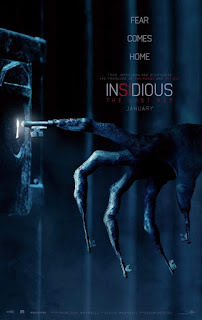 Insidious: The Last Key seems to be one of those serials that the filmmakers just don’t seem to want to let go. They appeal to people who are inclined not to think too deeply, but need a few thrills to make their lives complete (or so they think). Only hard-core fans of the Insidious series will like this film; others should stay away. US Army-Indian conflicts in the late 19th Century. It opens with a brutal scene of the massacre of a family on an isolated farm/ranch. American soldiers have experienced huge losses from Indian attacks, and some take great satisfaction in having retaliated in kind. Cooper shows the varying ways in which soldiers cope with the killing. One says, “If you kill enough people, you get used to it…but I hate losing my men.” Another says, “I was just doing my job” [in slicing Apaches from stem to stern]. “An eye for an eye; a tooth for a tooth”, is his mantra as he reads the Bible regularly to reassure himself. Cooper is eloquent in showing men pushed to their limit, the ethical/moral dilemmas life presents, and—most heartening—men transformed by their experiences. 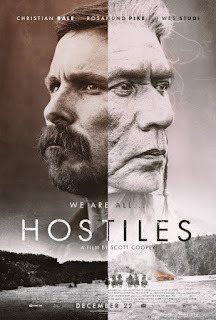 In Hostiles, we are captivated by Captain Blocker (Christian Bale in a stellar performance), who in the beginning sits patiently, but uncomfortably, when a trusted soldier under his command confesses to “Melancholia”, of which Capt. Blocker has no inkling. That doesn’t mean he doesn’t care for this soldier—he values him—but depression? That is not something he knows anything about. Then he is assigned a task that is anathema to him—accompanying Apache chief Yellow Hawk (Studi) and his family to Montana, for burial at his birthplace. The chief has cancer and is about to die, and the zeitgeist is turning toward being much more tolerant of the Indians. President Harrison has ordered that the chief be accompanied by the U.S. military to Montana to assure his safe arrival. Have you ever heard a silent scream? That is Capt. Blocker’s response to the order, which he cannot refuse without jeopardizing his pension. What kind of transformation can a person like Capt. Blocker make? It takes two warring parties traveling together (ahem...plus a woman?) to “humanize” him. This film is about the profound emotional experiences that such a man as Capt. Blocker undergoes that go from silent listening and grunts to real, tender, sharing moments he has with those around him. You don’t often see a cowboy/soldier self-actualized, but Cooper achieves just that. There are exemplary tender moments in this film, such as a simple “Thank you for your kindness” to a sympathetic laying of a hand on a person suffering in a tent, to a soulful “A part of me dies with you.” The upshot is that Cooper understands so many aspects of men especially (not to entirely exclude women) and portrays them as few filmmakers have been able to do. Christian Bale brings out the character of Capt. Blocker in a way that perhaps no one else could. His award-worthy performance (after stellar roles in The Big Short, American Hustle, and two Dark Knight films) should be recognized. Supporting roles are well covered by Rosamund Pike, Wes Studi, and Rory Cochrane, but this is really Bale’s tours de force. If you want to see a western with heart and substance, this is it.